One difficulty I noted with some of the pre-Infinite Crisis era Superman stories was their difficulty handling Lois Lane, and really the entire Super-cast -- Lois was sniping at Clark, Clark was lying to Lois, Lana was trying to come in between them. In the midst of this, Gail Simone's Action Comics run shines like a beacon -- smart, fun Superman stories where Lois and Clark actually act like a couple, stories that, while driven by continuity, are not continuity heavy, stories that could easily have been read separately, but taken as one in Superman: Strange Attractors, make for a satisfying story overall. Strange Attractors begins as Superman battles Dr. Polaris, and one of his multiple personalities, over Metropolis, only to have Polaris whisked away by Zoom and the Secret Society. 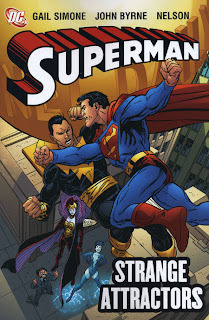 After the events of Sacrifice, Dr. Psycho tries to take advantage of Superman's shaken mental state; Black Adam intervenes, fighting with and then ultimately helping Superman. On Halloween, the Spectre comes to take Satanus, and Superman learns Satanus' identity as Colin Thornton; Lois gets a visit from her supposed-dead father. Then, while Superman is captured by the Queen of Fables, Lois is kidnapped first by a corrupt senator, and then by a Daily Planet photographer who's been stalking her; the photographer's half-sister, the villain Livewire, ultimately leads Superman to Lois. Whereas other writers seem to burn bridges between Clark and Lois, Gail Simone builds them. Both Clark and Lois are used well throughout the trade. Clark, of course, gets more airtime, but Lois has a swiftly moving plotline that has her chasing a Daily Planet story throughout the trade; many of the issues collected here end with Lois and Clark discussing their respective adventures. At one point, Lois enlists Lana's help to get background information of a villain that Clark needs. That Simone writes a good relationship between these three characters so naturally, and easily, is wonderful, and it is unfortunate that seeing the characters portrayed this way is such a wonder. I fondly recall the days of the Death of Superman, when Lois and Clark were each star reporters and any rivalry was good-natured, and Lana was a trusted friend to both. Lately we've seen writers try to reintroduce the love triangle in a way that makes all the characters less endearing, instead of more. Simone's portrayal, if anything, swings too far in the other direction -- Superman saves Lois twice in the book, and carries her three times, and Lois swoons a bit too dramatically; however, as compared to all the bickering and infighting, I'll take a little swooning any day. John Byrne, aided here by inker Nelson, turns in fantastic work; sometimes I feel that Byrne's art has too many tics (people in vests, for one), but his Superman work here is fresh and modern, especially the Black Adam fight and the Halloween issue. Jimmy Olsen, throughout the trade, looks to be about twelve years old, but in general is was quite nice to see Byrne back on Superman. And lest I forget to mention, a big THANK YOU to Gail Simone for finally tying up the Colin Thornton/Satanus plotline. It's been over ten years since readers learned that Satanus was Colin Thornton, and in that time, though Superman's come close to learning the truth once or twice, there's never been the big revelation. Simone handles it in one panel here, and the quick, humorous nature of the reveal makes it all that much more fun. Great work all around. On now to Greg Rucka's last Wonder Woman trade, and from there more Infinite Crisis crossovers.